Well this is a first. 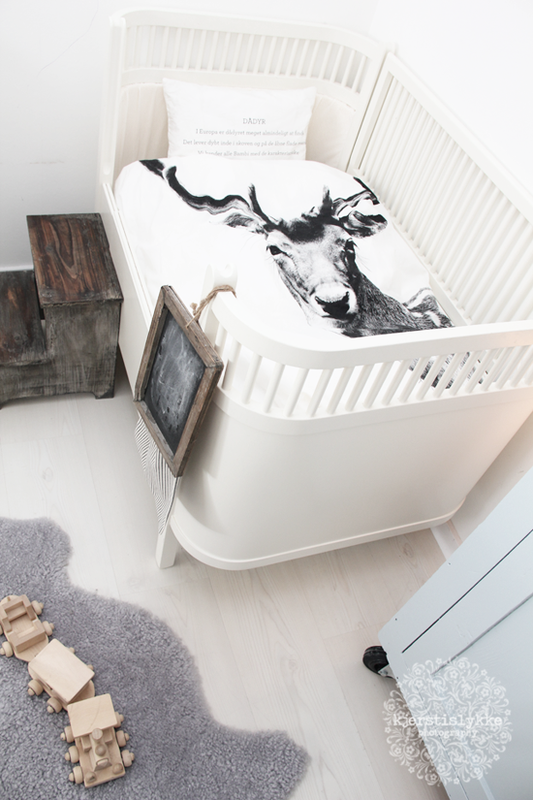 A blog post about nursery design. You can tell someone is pregnant around here, eh? :) After all of your supportive and helpful comments in my baby announcement post, I decided that I'd occasionally share some of my nursery and kid's room inspiration going forward to encourage new moms, moms-to-me like me and to even shine some light on the topic for those of you who aren't mothers (nor plan to be) but are still curious about how to pull together a nice nursery. 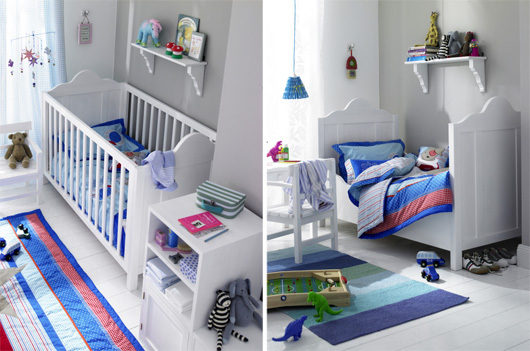 Whether you want children or not, I think every woman has a least a friend or two who has children and this is where you can be the become the coolest auntie ever with your amazing knowledge of nursery design (smile). Darling bedroom in Brussels via Milk. The best learning for me is always hands-on, fall down, get up again and keep trying - so I'm going to approach nursery design in my typical Holly style. I know color theory, how to create "zones" in kid's rooms, I get the importance of a good floor plan but I'm following my heart with the rest and see where it takes me (and my wallet). So far it seems like the bed will be white and I'm thinking to go for a convertible crib that turns into a toddler bed later on. I'm also going for simplicity as one trip to the local baby superstore over the weekend taught my that every company in the world is trying to entice you into buying lots of product you don't really need. I found a foldable baby bath that I thought was totally helpful and that won't take up much room so I may order that soon. I also have my eye on a few strollers but at over ONE THOUSAND EUROS each, I'm thinking maybe I need to put more thought into my spending. As for room decor, I definitely am leaning towards grays, blues, greens and yellows for a boy and grays and for a girl - lots of floral Liberty prints, creamy whites, mustard, some red, greens, every color really but with a neutral base. 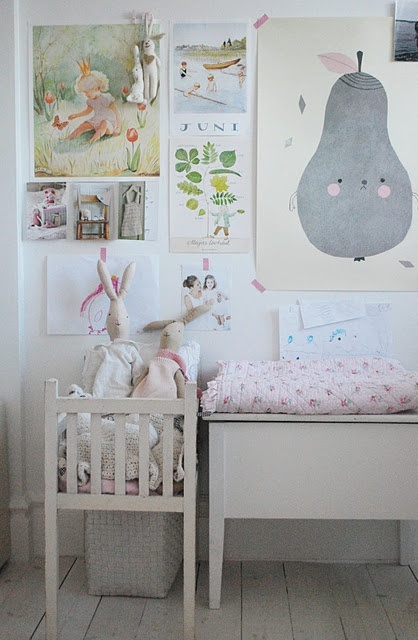 My aesthetic is much more European - particularly English and French, not so much the typical American nursery with everything perfect and matching. That works for lots of my friends and it's beautiful, but the rest of my home is so haphazard and mismatched, the nursery will most likely be the same - quirky and very much a reflection of my personal style. Then later, the little one can make their own decor choices but for now, it's a room that I'm more than excited to get started on! 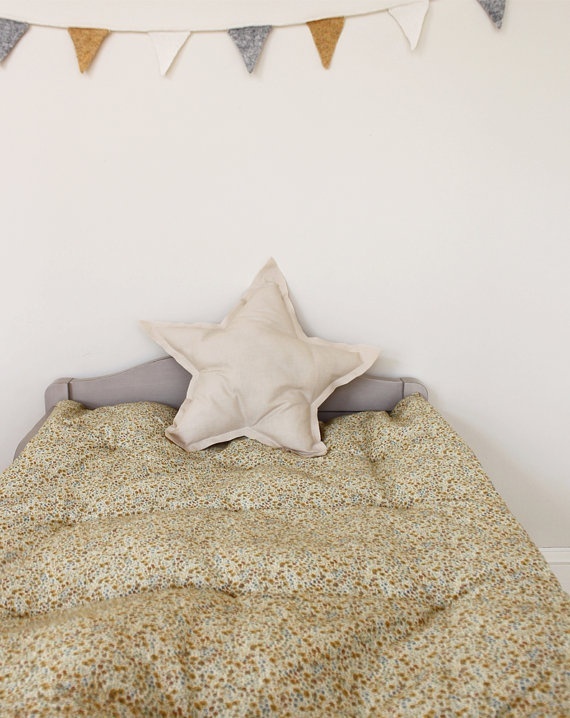 In this post, I'm sharing some of my favorite nurseries and rooms for kids that I've found online so far that click with me. I have NO clue if I'm having a boy or a girl yet, I'll find that out early next month, so I'm not really thinking about "boy" or "girl" decor right now. Just focusing more on a vibe I'm going for, what I like, and how I imagine this new little room in my home. Gorgeous monochromatic simplicity by kjerstis lykke. You can barely see it, but I love the old blue wooden cabinet. 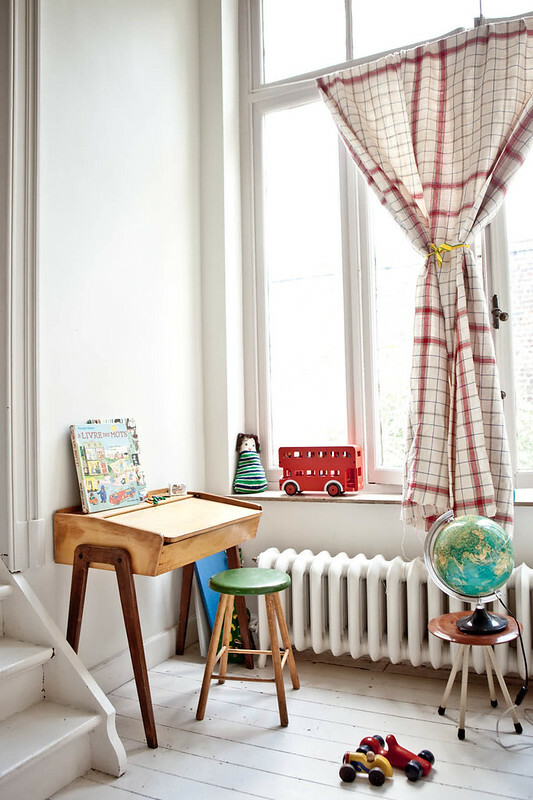 Little french loft apartment nursery on Planete Deco. Louise Lemaire photo for VTWonen magazine in The Netherlands. Sweet art arrangement using simple washi tape by julias vita drommar. Twinkle lights under a shelf near the crib from Sissy & Marley. I also love the little rug on the floor. Sweet color scheme from Play Spaces on Pinterest. 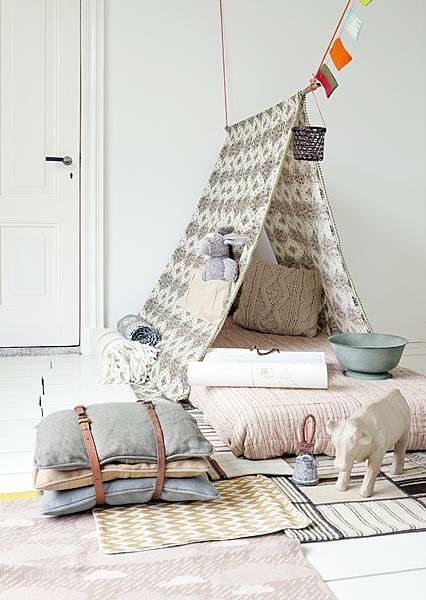 I also like the layered rugs though not so practical with a clumsy mom holding an infant! The mix of patterns is also so pretty. Boy's room in Brussels via Milk. You can totally see the English sensibility here - his mom is a Londoner. 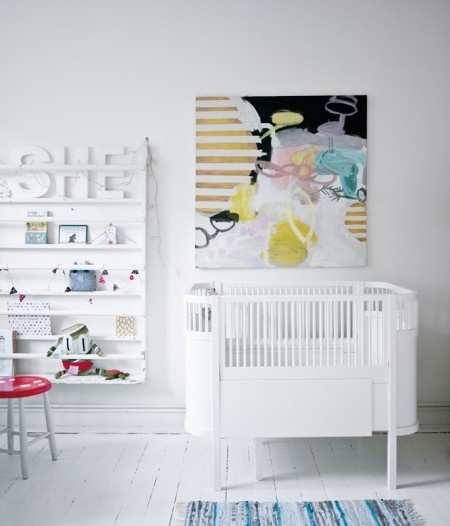 Really love this Sebra crib shown on Delikatissen. 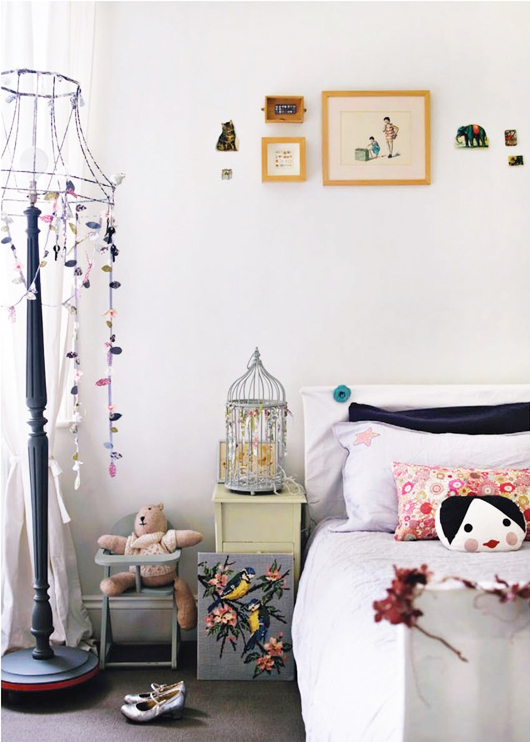 The daughter of stylist Sania Pell has the sweetest little bedroom that appeared in my book, Decorate Workshop, as photographed by Debi Treloar. Love this bed design from car möbel (not the room design!) because it's a crib that later converts into a toddler bed. Parents is this a good idea? I'd love your opinion on convertible beds! What do you think of these rooms? 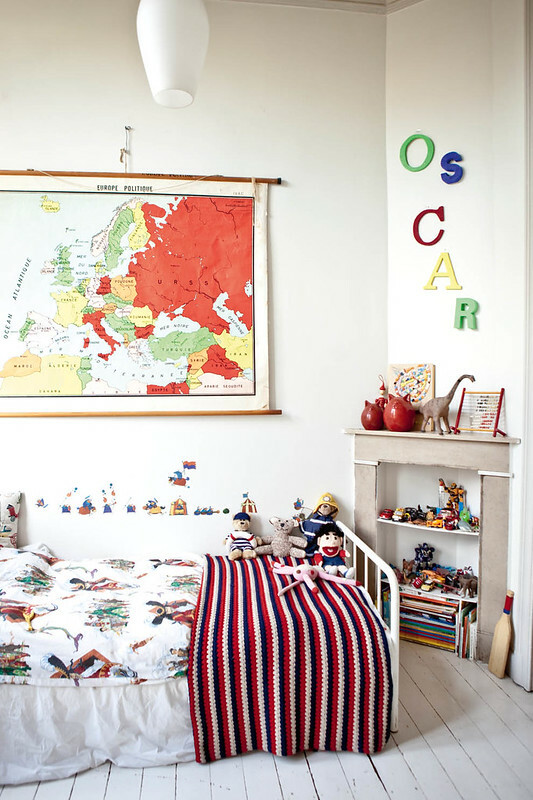 Where do you go online for kids room inspiration? I'd love some tips!